The United Mexican States, commonly known as Mexico, is a federal constitutional republic located in North America. 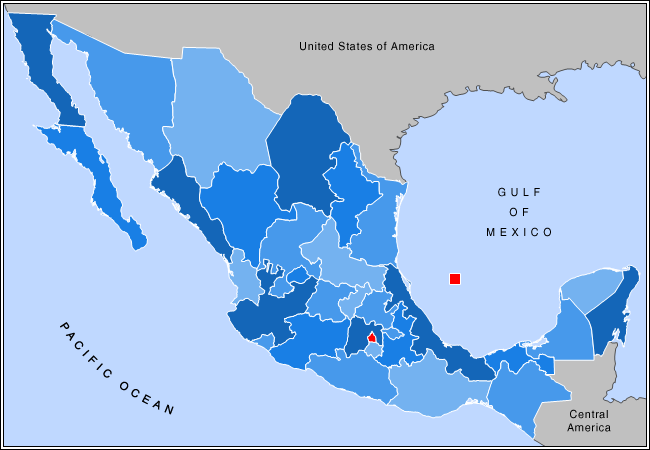 Mexico is bound on the north by the United States; on the south and west by the North Pacific Ocean; on the southeast by Guatemala, Belize, and the Caribbean Sea; and on the east by the Gulf of Mexico. Area and size ranking: covering almost 2 million square kilometers, Mexico is the fifth-largest country in the Americas by total area and the 14th largest in the world. An enlargeable topographic map of Mexico. Capital: Mexico City (one of the world's most populous cities). Economic rank: Mexico is the 12th largest economy in the world by gross domestic product (GDP) by purchasing power parity. North American Free Trade Agreement - Mexico's economy is strongly linked to those of its NAFTA partners. ^ a b c "Mexico". The World Factbook. United States Central Intelligence Agency. July 6, 2009. Retrieved July 23, 2009. ^ "Mexico Archived 2001-02-10 at the Wayback Machine". The Columbia Encyclopedia, 6th ed. 2001–6. New York: Columbia University Press. Mexico City, or the City of Mexico (Spanish: Ciudad de México, American Spanish: [sjuˈða(ð) ðe ˈmexiko] (listen); abbreviated as CDMX, Nahuatl languages: Āltepētl Mēxihco), is the capital of Mexico and the most populous city in North America. Mexico City is one of the most important cultural and financial centres in the Americas. It is located in the Valley of Mexico (Valle de México), a large valley in the high plateaus in the center of Mexico, at an altitude of 2,240 meters (7,350 ft). The city has 16 boroughs. The 2009 population for the city proper was approximately 8.84 million people, with a land area of 1,485 square kilometers (573 sq mi). According to the most recent definition agreed upon by the federal and state governments, the population of Greater Mexico City is 21.3 million, which makes it the largest metropolitan area of the Western Hemisphere, the eleventh-largest agglomeration (2017), and the largest Spanish-speaking city in the world.Greater Mexico City has a GDP of $411 billion in 2011, making Greater Mexico City one of the most productive urban areas in the world. The city was responsible for generating 15.8% of Mexico's GDP, and the metropolitan area accounted for about 22% of total national GDP. If it were an independent country, in 2013, Mexico City would be the fifth-largest economy in Latin America, five times as large as Costa Rica and about the same size as Peru.Mexico’s capital is both the oldest capital city in the Americas and one of two founded by Native Americans, the other being Quito, Ecuador. The city was originally built on an island of Lake Texcoco by the Aztecs in 1325 as Tenochtitlan, which was almost completely destroyed in the 1521 siege of Tenochtitlan and subsequently redesigned and rebuilt in accordance with the Spanish urban standards. In 1524, the municipality of Mexico City was established, known as México Tenochtitlán, and as of 1585, it was officially known as Ciudad de México (Mexico City). Mexico City was the political, administrative, and financial center of a major part of the Spanish colonial empire. After independence from Spain was achieved, the federal district was created in 1824. The following timeline traces the territorial evolution of the U.S. State of New Mexico.